How women’s activism shapes history. Life & Letters, Magazine for the College of Liberal Arts at the Univesity of Texas at Austin, Issue No. 31, Summer 2018. 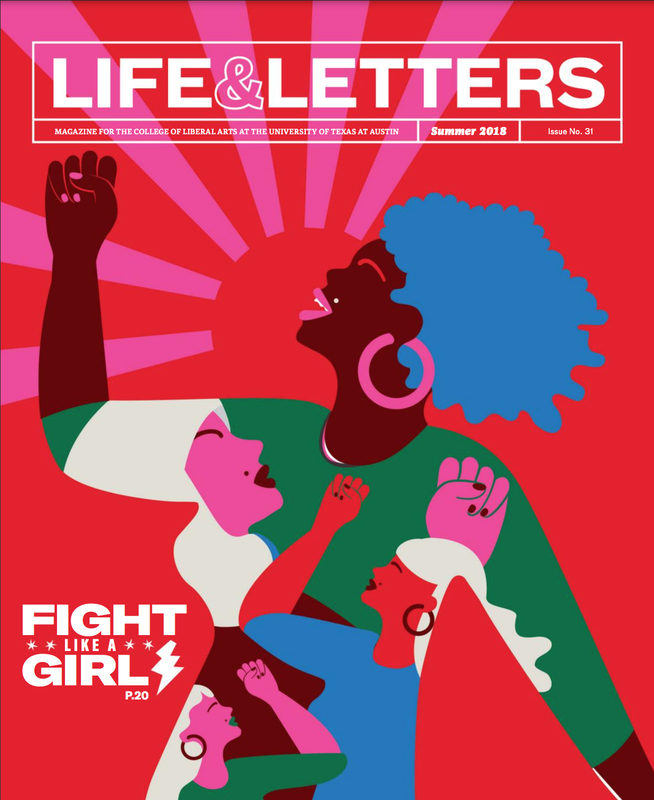 “Fight Like a Girl: How Women’s Activism Shapes History” appears as a feature article in the Summer 2018 edition of Life & Letters, a publication of the Liberal Arts College at the University of Texas at Austin. The article, written by Rachel Griess, is accompanied by a video. Life & Letters and the Humanities Media Project at UT-Austin collaborated on the video. The article grew out of a Fall 2017 History class taught by UT History Professor Laurie Green. Glenn Scott and I, both of whom worked with Austin’s underground newspaper, The Rag (1966-1977), identified a list of women to contact, some far flung, most still living in Austin. Dr. Green had her students gather oral histories from these women, all involved in ’60s and ’70s movements and uprisings. Three of us are highlighted in the Griess article: Barbara Hines, Martha Cotera, and me. Two of us, Barbara Hines and me, were Rag staffers and participants in Austin’s women’s liberation movement. Martha Cotera is well known for her Chicana and Latina activism. Those of us who were interviewed were invited to class presentations made by the students at an end of semester event. While, it is still somewhat difficult to accept that we are “history,” it is clear that students see us that way. Their questions and insights were as illuminating to me as my history appeared to be to them. The video includes some footage made at the class presentation and interviews with Dr. Laurie Green, the three of us featured in the magazine article, and several of the students involved in the collection of the oral histories. The taped interviews will be transcribed and housed at the UT Dolph Briscoe Center for American History. I have been donating papers to the Sara Clark collection there as well, and encourage others with ’60s and ’70s material to do the same. The video incorporates photographs of documentary genius and former Rag staff photographer Alan Pogue. The class relied on the book, Celebrating The Rag: Austin’s Iconic Underground Newspaper, edited by Thorne Dreyer, Alice Embree, and Richard Croxdale, as source material. Published in 2016, the book continues to be cited as a unique deep dive into the history bracketed by the life of The Rag, 1966-1977. This entry was posted in RagBlog and tagged Alice Embree, Barbara Hines, Laurie Green, Martha Cotera, Rag Bloggers, The Rag, UT-Austin, Women's Liberation. Bookmark the permalink.